WordToPdfConverter program allows you to convert one or many microsoft word (2007+) files to PDF files. The program extracts text, images and information about font colors, sizes and styles used in the word files. Then these things are placed in PDF files when they are generated. The main APIs used in this program are Apache POI and iText. Apache API is used to extract information from a microsoft word file while iText is used to create a PDF file. 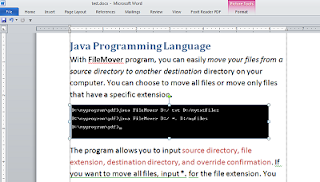 In the code above, the XWPFDocument (in POI library) is used to construct a Microsoft Word file. The object of this class accept the FileInputStream as its argument. The FileInputStream class is used to read the Microsoft Word file. When you have document that contains all data of the original Microsoft Word file, you can get the paragraph objects inside the document by using the getParagraphs() method. This method returns all paragraphs found in the original Microsoft Word file. In each paragraph object, there are many smaller items called run objects. From each run object you can extract text, image, and formatting styles that are applied to the text when the Microsoft Word file is written. Once you have the text, images, and formatting styles data, you can write them to the destination pdf file by using classes and methods from the iText library. I converted a 2003 doc file that contains images to 2007 docx file and ran the program to convert the docx file to pdf file. It worked good. All images and font styles are preserved. Please make sure that the images in the doc file are pictures (Insert->Picture). They should not shapes, ClipArt, or SmartArt. zeonpadpdf is java library for converting Microsoft Word, Excel, PowerPoint, Publisher, Visio, Outlook, images,text document to PDF. It works for both Desktop and Server application. It generates the high quality PDF file that are adobe Acrobat compatible. this library does not support multi-threaded conversion. this library is currently based on the Java COM bridge called JACOB, a bridge is required between COM and the Java Virtual Machine. its 100% free. Supports both 32bit and 64 bit windows os. I tried zeonpad, it worked good on my local system. but it is raising an exception when used ton server. Do you try to convert ms word document with khmer unicode to pdf? does it work? Today there is no free api in Java that is able to do conversion from khmer unicode word to pdf. I will try to do it later. zeonpad provide free java api to convert ms office documents to pdf. Hey Buddy! can you please share some simple way of converting JPG to PDF . I want to share this JPG to PDF converter with you. You must try this once. It is free and easy to use. Thank you for sharing this. I know Microsoft Office has its own plug-in for saving Word and Excel as PDF files. But if anyone need to convert Word to PDF on other applications, a third-party converter is necessary. I use a converter, which support Word, Excel and Tiff to PDF, tiff, word and convert Word to PDF, I think it's also a good tool. I'm not a developer, i always use this free online pdf to word converter to convert pdf to word online. I have tables in my word doc. But this code is not writing the tables into pdf. How do I achieve this? What all jar files do we need to add in order to Run the program?? Good blog. After searching lot I got which jars to be used. Here, it has been described with complete clarity which displays how simple it is to have the conversion of word to pdf. Indeed you have tried your best to explain the whole method thus barring a few points; it can safely be considered a good attempt. You may visit: Word to pdf server.